What are Permanent Injury Damages and How are they Determined in a Florida Car Accident Case? In Florida, like in most states, when someone is injured in a car accident, the injury victim can recover damages from the responsible party for things like medical expenses and lost wages, as well as monetary compensation for their long term, permanent injuries. Essentially, the jury looks qualitatively at how the permanent injury has effected one’s life, whether in work or in the loss of enjoyment of life. If the defendant is found to be negligent, juries are instructed to award damages for pain and suffering and mental anguish. Juries are instructed to award what they believe to be to be fair and just in light of the evidence presented. Florida’s Statute of Limitations (Fla. Stat. 95.11(3)(a)) places time restraints on when an accident victim can file a negligence lawsuit. According to this statute, if a negligence lawsuit is not filed in the appropriate Florida court within four (4) years of the date of injury, then the court will not hear the case, and the victim will not be able to receive any compensation for his or her injuries. In other words, the presiding judge will throw out the lawsuit in response to a Defendant’s motion requesting that the car accident case be dismissed with prejudice. Meaning, a lawsuit can never be filed again on their claim. What Damages Can a Personal Injury Victim Recover? 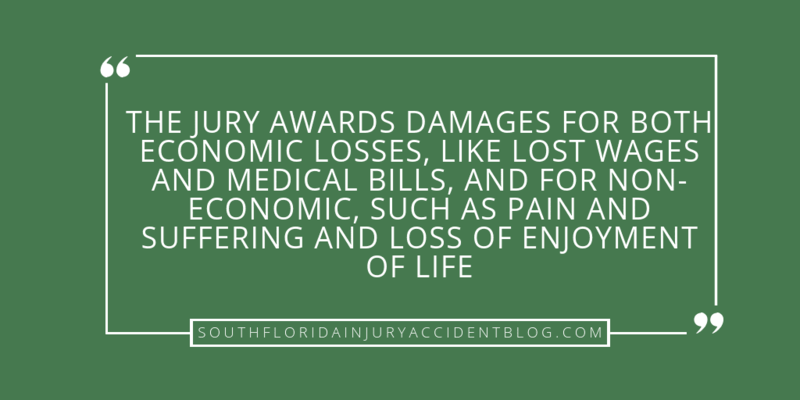 The jury awards damages for both economic losses (lost wages and medical bills) and for non-economic (such as pain and suffering and loss of enjoyment of life). Juries are given wide discretion and latitude in determining the amount of damages it will award to the victim. The Jury will use the facts of the case during the trial period, while following the jury instructions given by the judge when decided what damages will be awarded. What are permanent damages in a car accident case? Permanent injuries are those that inhibit the ability of the person to use their body or their mind in ways they could before the accident, and cannot be fixed. Damages awarded to people who suffer from these types of losses are usually large because it is expensive to cover the long-term course of care and rehabilitation for these injury victims. How are permanent damages determined in a car accident case? Notwithstanding what you hear or read elsewhere, the circumstances of the particular case determine how the victim will need to prove and determine their losses for permanent injuries. For example, expert testimony from a doctor may or may not be needed. Sometimes, the permanent injuries are so obvious that the jury doesn’t need a physician or medical expert to take the stand and explain to them how and why the injury is not a temporary one. For example, a plaintiff who had not fully recovered 2.5 years after the accident was held not to need a physician’s opinion and the jury could infer that the injuries were permanent. Washington B. & A. Electric R. Co. v. Cross. Similarly, when an accident victim provided evidence that she had to take a job at a lower salary after recuperating at home for 6 months subsequent to a six-week hospital confinement, the courts held that permanent injuries existed without the need for a doctor to confirm them. See, Hecker v. Union Cab Company. In other instances where the injuries are not so obvious, for example traumatic brain injuries (TBI), a doctor may need to evaluate the victim and provide his or her opinion regarding the permanent and long-term nature of the harm sustained by the accident victim. Therefore, in serious car accident cases, the calculation of permanent injury damages may involve documentation and projection into the long-term future of the victim’s needs and may or may not require a medical opinion to support the permanent injury claim. Juries award what it believes to be fair in light of the evidence presented. A good piece of advice if you have been harmed in a car accident and you have permanent injuries, is to speak with an experienced personal injury lawyer before you file a claim to learn about some of the issues that can arise with these claims, including the type of evidence needed to prove a claim and the type and amount of damages you can recover. Most personal injury lawyers, like Alan Sackrin, will offer a free initial consultation (over the phone or in person) to answer your questions.